The Seahawks show a dominant performance on the ground as Marshawn Lynch led the team to 350 yards on the ground to set a new team record. Russell Wilson also had more than 100 yards, but has not been the same in the last five games as he was in his first four games to start the season. Adam talks about where he may be struggling. Brandon Mebane is out for the season. As of the recording he hadn't yet been placed on injured reserve. Because he's in the negotiation phase of the steps of grief, Adam talks about how he would trade the win against the Giants just to have Mebane back for the season. Next up, the Seahawks head to Arrowhead to take on the Chiefs. The guys talk about the tough test Kansas City will bring. Brandan talks about one statistic about the Chiefs defense that may be misleading and offer the Seahawks offense a vulnerability to attack. 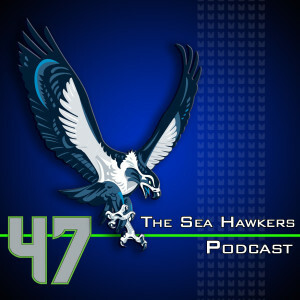 Hall of Fame quarterback Warren Moon, a 17-year NFL veteran and Seahawks broadcaster, joins the show this week to say thanks to service members past and present and talks about Russell Wilson, Brandon Mebane and cookies. To close the show, “Do Better” nominees include the New Orleans Saints (by request of a listener) and some Bears fans who have gone way over the line. It's an all-Seahawks “Better at Life” segment with Dan Quinn and Marshawn Lynch taking this week's honors.